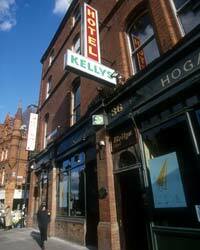 Kellys Hotel is a highly recommended family hotel approved by the Irish Tourist Board. This hotel offers high quality accommodation at low cost. It is perfect for people visiting Dublin on a budget. Ideally situated in the heart of Dublin’s City Centre the hotel is perfectly located for business, shopping or exploring. Many major tourists attractions, famous night life spots and shopping facilities are all nearby. Kelly's hotel has a variety of rooms, single, double, twin, triple or a family room all recently refurbished to a high standard. All the rooms are equipped with the modern facilities for convenience and comfort. Facilities include full ensuite facilities, colour television, direct dial telephone, tea and coffee making facilities, iron and ironing board, wake up call and laundry services. The friendly helpful staff will ensure that the guest will enjoy a relaxed and happy visit. Kellys hotel is home to a very popular residents bar which has a unique friendly atmosphere and for all Guinness lovers they serve a great pint of the black stuff. The hotel is surrounded by a wide variety of cafes and restaurants catering for every taste and appetite. From Georges Street to Temple Bar to O Connell Street the guest will be spoiled for choice and will enjoy some of the finest cuisine in Europe. Located in South Great Georges Street most facilities are close at hand. A visit to Georges Street Arcade which is only five doors from the hotel is highly recommended. This arcade offers the most amazing Celtic jewellery, unique clothing perfect for the arty free spirit, beautiful original knitwear, lovely little cafes and fresh food stores. Grafton Street with its wide range of shops, friendly atmosphere and talented buskers is close by. Temple Bar the hottest night spot in Ireland is just a few steps away and is well known and recommended for its quaint shops, intimate cafes, restaurants, great pubs and is very popular with both tourists and locals. Trinity College, Dail Eireann, The National Museum, The National Gallery are all close at hand.